469 Beacon is located on the south side of Beacon, between Hereford and Massachusetts Avenue, with 467 Beacon to the east and 471 Beacon to the west. 469 Beacon was designed by architect John H. Besarick and built in 1888-1889 by building contractor Asa Harden Caton for speculative sale, one of two contiguous houses (467-469 Beacon). 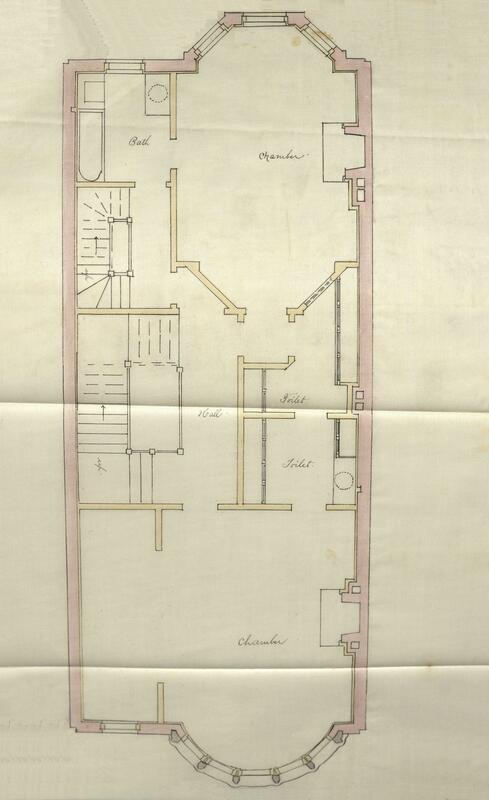 Asa Caton is shown as the owner of 469 Beacon on the original building permit application, dated October 6, 1888, and on the final building inspection report, dated October 29, 1889. Click here for an index to the deeds for 469 Beacon, and click here for further information on the land on the south side of Beacon between Hereford and Massachusetts Avenue. On August 18, 1890, 469 Beacon was purchased from Asa Caton by leather dealer Thomas Emerson Proctor. He and his wife, Emma Esther (Howe) Proctor, lived at 327 Beacon. Thomas Proctor purchased 469 Beacon for his daughter, Anne S. Proctor, and her future husband, Charles G. Rice, a hide and wool merchant. They married in October of 1890 and made it their home. They also maintained a home in Hamilton. Prior to their marriage, he had lived at 341 Commonwealth with his parents, Nehemiah Webster Rice and Josephine (Emery) Rice. On November 29, 1890, Thomas Proctor transferred the property to himself as trustee for the benefit of Anne Rice. Thomas Proctor died in December of 1894, and his son, Thomas Emerson Proctor, Jr., was named trustee in his place. The Rices continued to live at 469 Beacon during the 1898-1899 winter season, after which they made Hamilton their primary residence. On December 19, 1899, 469 Beacon was purchased from Anne Rice’s trust by Kate Shakespere (Haman) Jacques, the wife of William White Jacques. They previously had lived in Newton. They also maintained a home in Chester, Nova Scotia. By the 1918-1919 winter season, William and Kate Jacques were joined by their son-in-law and daughter, Baron Edgar de Brueggen and Baroness Margaret (Jacques) de Brueggen. Baron and Baroness de Brueggen continued to live at 469 Beacon during the 1921-1922 season, but moved thereafter. By the mid-1920s, and possibly before, the Jacqueses were joined at 469 Beacon by Miss Fannie Gladys Johnston. She was a secretary and probably served as William Jacques’s assistant. On April 13, 1929, Kate Jacques transferred 469 Beacon into William Jacques’s name, and on May 2, 1930, he transferred it into Fannie Johnston’s name. Kate Jacques died in early 1932 and William Jacques died in June of 1932. Fannie Johnston continued to live at 469 Beacon. In 1933, she married to Armen V. Garabedian, and on April 9, 1934, she transferred the property into her and her husband’s names. They continued to live at 469 Beacon during the 1934-1935 winter season, but moved thereafter and by 1937 were living in Milford, New Hampshire. The house was not listed in the 1936 and 1937 Blue Books, nor in the 1935-1937 Lists of Residents, and was shown as vacant in the 1935-1937 City Directories. On March 30, 1937, 469 Beacon was acquired from the Garabedians by Charles A. Ramsey, and on the next day he conveyed it to the Boston School of Physiotherapy. The Boston School of Physiotherapy was operated by Dr. Andreas (Andrew) Forest Christian, a physician and physiotherapist, who also made 469 Beacon his home. A widower, he previously had lived and maintained his offices at 20 Hereford. 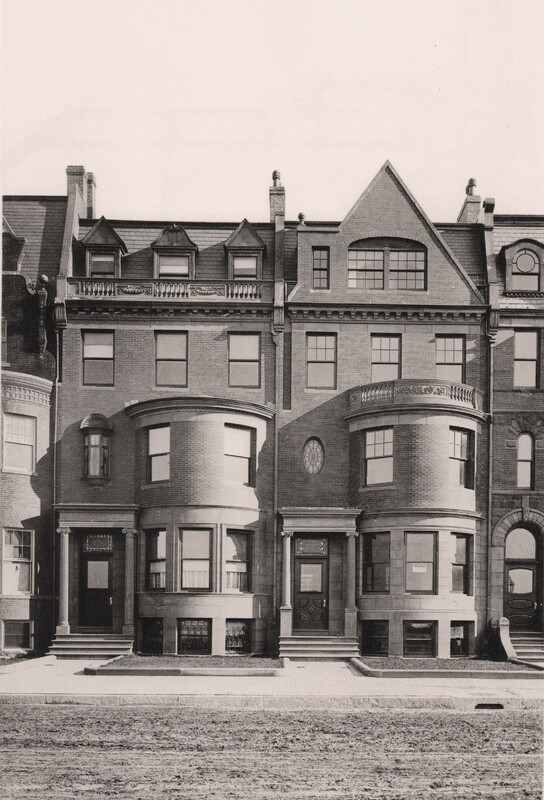 On September 20, 1939, the Supreme Lodge of the New England Order of Protection foreclosed on a mortgage it held on 469 Beacon and took possession of the property. Dr. Christian moved back to 20 Hereford. 469 Beacon was shown as vacant in the 1940-1941 City Directories and was not listed in the 1940 and 1941 Lists of Residents. On January 20, 1941, it was acquired from the New England Order of Protection by Jacob Deitch. 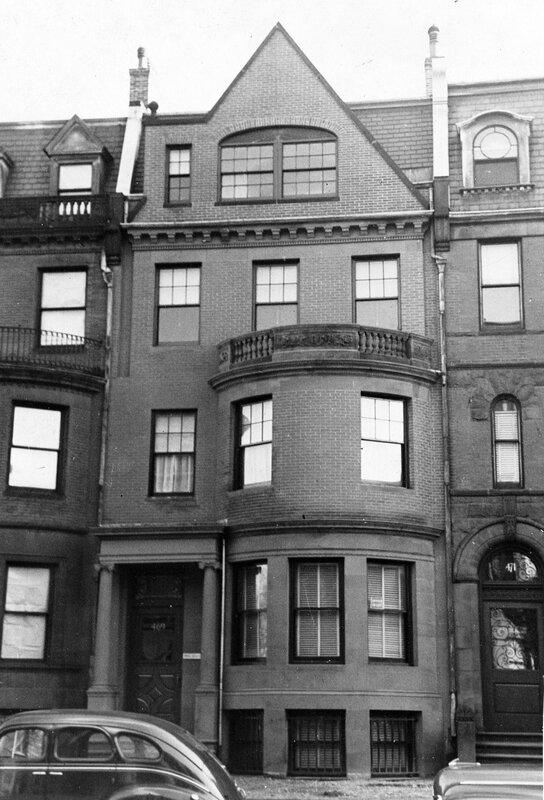 He lived at 379 Shawmut Avenue and owned a shoe store at 381 Shawmut Avenue. He was recently divorced from Jennie (Jeanette) (Rabinowitz) Deitch; in 1940, they had lived at 249 Washington in Dorchester. In April of 1941, his son, Dr. Emmanuel Deutsch, filed for (and subsequently received) permission to convert the property from a single-family dwelling into three apartments and a doctor’s office. He lived at 249 Washington in Dorchester with his mother. 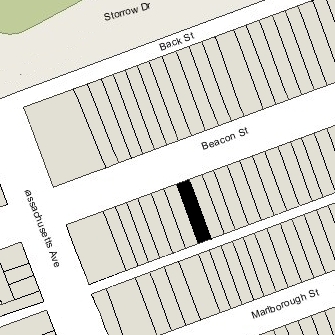 By 1942, Jacob Deitch and Emmanuel Deutsch had moved to 469 Beacon. In the fall of 1942, Emmanuel Deutsch married Ruth Julie Charak and they lived in one of the apartments. He was a physician and specialist in stomach and intestinal cancer and also maintained his medical office at 469 Beacon. 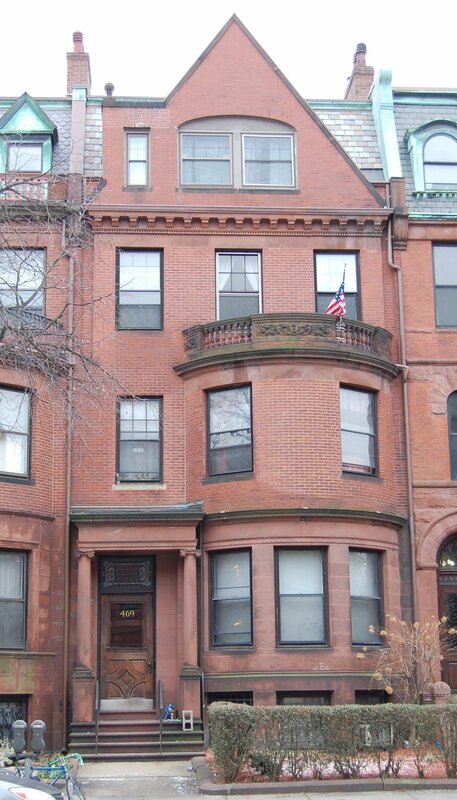 After serving in World War II, he continued to maintain his office at 469 Beacon but he and his wife lived in Cambridge. On June 10, 1969, Jacob Deitch transferred the property to Emmanuel and Ruth Deutsch as trustees of the Deutsch Realty Trust. He continued to live in one of the apartments at 469 Beacon until his death in March of 1973. In October of 1986, Emmanuel Deutsch, then a resident of Belmont, filed for (and subsequently received) permission to convert the property from three apartments and a doctor’s office into five apartments and a doctor’s office, which was indicated as being the existing condition. Emmanual Deutsch died in November of 1986. On December 30, 1986, 469 Beacon was acquired from Ruth Deutsch by Thomas P. Jalkut and Kenneth L. Grinnell, trustees of the 469 Realty Trust. On August 11, 1989, 469 Beacon was acquired from State Street Bank and Trust Co., successor trustee of the 469 Realty Trust, by real estate dealer George P. Demeter, as trustee of the Demeter Realty Trust. On December 15, 1989, he transferred the property to his son, Panos G. Demeter, trustee of the 469 Beacon Street Realty Trust. On February 1, 1996, Panos Demeter transferred 469 Beacon to the Unicorn Realty Limited Partnership, managed by Unicorn Realty, Inc. (of which he was the president), and on February 1, 2016, the Unicorn Realty LP transferred the property to the 469 Beacon LLC, managed by the Demeter Development Group LLC. 469 Beacon remained an apartment house in 2017.